It’s Love Month here at Inspy Romance, and God’s been teaching me some challenging lessons about love! Both about what truly loving others means, and about His love. Especially, about going deeper into prayer and trust. As some of you know, my husband has several health issues that make our life together a little more complicated. 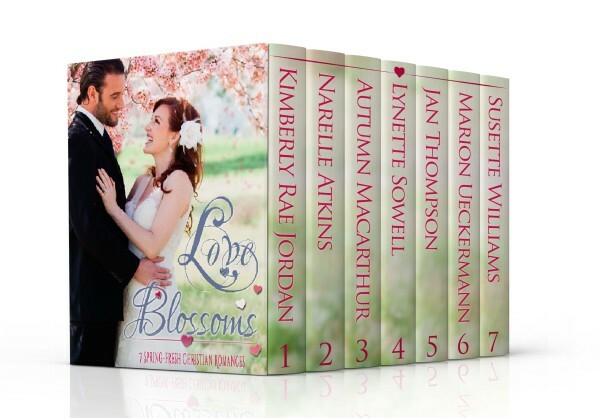 The heroine of my latest book, A Lesson in Love, included in the Love Blossoms boxed set, also has a life complicated by health issues. 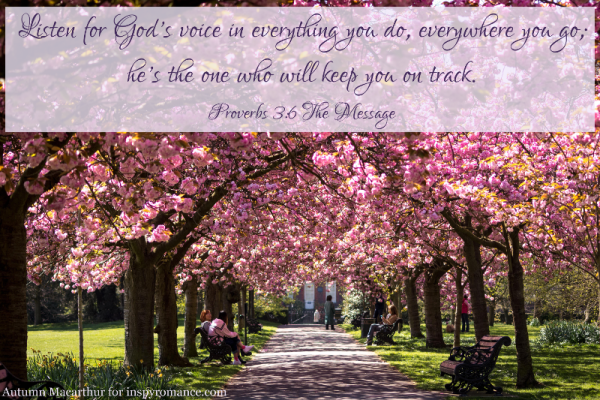 A lovely reader who reviewed the story emailed me to say how much it made her think of a Bible verse I hadn’t included in the book, Proverbs 3:5-6. My word for the year is “Surrender” which is very close to “submit”, the way the NIV translates what God asks us to do. But submitting and surrendering isn’t always easy, whether to God, or to the needs of others in our relationships. I thought it was a rebellion thing. The not-yet-perfected part of me that still wants to resist God and rebel against Him. The “Me me me” part. I pray so often asking God to heal my stubborn nature and bring me into obedience to Him! But it’s looking like God’s biggest lesson for me now isn’t as much about submitting and surrendering, as it is about trusting that when I do that, He will support me. It’s about allowing Him to support me. And also about allowing Him to provide that support through others. God doesn’t mean for us to walk this life alone. Not all of us marry. Not all of us who marry have our happy-ever-afters in the way we dreamed of them. But God intends a life of love for us all. A life of giving love to others, and a life of receiving love from others. That’s such a big part of His plan and purpose for us all. Maybe the biggest part. Sarah, in A Lesson in Love, can give love, but she can’t accept it. God’s lesson for her is about letting in the love that’s so near to her. I think He has the same lesson for us all. At the start of the week, Sally asked us to think about who we needed to show more love to. Heather asked us “Are You Unlovable?” Good true questions. Hooking into those, I want to ask a different question today. Where in your life might God be wanting you to let more love in? What parts of yourself do you resist believing God could really love? And where might He be wanting to use those around you to show how deep and wide and real His love is? I pray, for me and for you, that like my heroine Sarah we discover that when we listen to God, and trust Him enough to surrender to Him, He fills us with His love. We can see the love that was there waiting for us all along. Love is all around us. Love is always all around us. Proverbs 3:5-6…one of my favorite verses, Autumn, and one that I meditate on often. I’m sorry to hear about your husband’s health issues. I’ll keep him and your family in my prayers. I love and live for that bible verse along with Jeremiah 29:11. At the end of the day, we can not do it on our own and that’s why we must trust that God is our redeemer and he lives. So yes, we are all capable of love and being loved. That’s why it’s up to us to not let society causes us to harden our heart. Thanks for sharing your blog and sorry to hear about your husband. I am sure your faith in God will make everything easier to handle. Those are both comforting verses, Kaleen. God is so good to us! What you say about not allowing our hearts to be hardened by what happens in the world is so important and true. And 100% we can’t do it on our own. We are so used to thinking we need to try harder, do better, be more lovable, when what we really need to is stop struggling and open our hearts to God, who loves us so deeply and unconditionally. I enjoyed your encouragement to let love in. I needed to remind myself of that. I had an abusive childhood and tend to assume I’m unloved, but the opposite is true. My husband and kids and friends all love and value me. How much more does our heavenly Father love us!?! Hugs Diana! It’s a lot more challenging to feel our Father God’s love when we didn’t experience that in our childhoods. So glad that you can feel that love all around you now. God is reminding me I need to slow down and be still with Him and let it really soak in. Thank you for sharing. Your post could have been written by me, just not as well. When my husband was diagnosed with cancer near our son’s 9th birthday, I struggled. It took me some time to get to a better place and to surrender him and our future as a family. I don’t know why some things happen, but I find comfort knowing that God does. I fall back on 2 Corinthians 1:3-4. We were able to help support another couple walking a similar path around the same time. When our then 11 year old son was heading into surgery at 1 AM one Sunday morning a few years ago to have his appendix removed, I was more quickly able to surrender him to God. Today, I continue to be thankful that my family is intact – Praise be to God. I also trust that if these situations had turned out differently, God would have a plan for my life to His honor and glory. Praising God that your family came through those trials! joy that comes from heaven itself. Yes, thank you, you are right. James lays it all out so well. As our Pastor says – You are loved. The God of the Universe held nothing back to bring you back to him. I know I am loved, chosen and pursued and that brings such joy and peace. The enemy of our souls can keep us out of the Light if we believe the lie that we are unlovable and unloved. It may be one of his simplest and most effective tactics. I know God has been teaching me a lot about His love in the past year, and it keeps spilling out in my stories, too. It’s a message we all desperately need to hear, embrace, and be saturated in. So right, Valerie! If it’s not love, it probably comes from the enemy of love. I read A Lesson in Love last week and really appreciated that you highlighted what could be called the “worse” of “for better or for worse” but also that there can be love and joy in the hard places. Thanks for a beautiful post, Autumn! Sometimes I get so busy condemning myself for not being loving enough that I forget God has plenty of love to fill me up. I appreciate the reminder. I think that love is a complicated thing. Finding it in a a partner has been difficult for me.I do believe that God is always there for me though!